The seven best waterparks across Thailand to escape the heat. When the sun moves out of Pisces in April, the heat starts to get serious. Temperatures rise to 40 degrees Celsius and beyond and drain us of all our energy. Some of us are lucky enough to live within walking distance of the country’s best beaches, others cycle to the nearby waterfalls and cascades to take a break from the heat. But for those of us who are stuck in the urban jungle, the choices tend to be staying cooped in an air-conditioned room or making tracks out of town to the nearest waterpark. This week, we look at the seven best waterparks at which to chill. Tucked away in Pak Chong district, a popular destination with Bangkok’s get-out-of-towners, Scenical World Khao Yai is a new kid on the block. A heady combination of amusement park, shopping mall and hotel, it’s also home to Splash World, where you can experience the water in a variety of playful and adventurous ways. In pride of place is the Splash Coaster where you sweep down, twist, turn and climb on a thrilling run of 180 metres. The brave can get their adrenaline kicks by whizzing along the circular slide at high speed before plunging into the Space Bowl. Leave it up to the kids and they’ll probably choose to spend every single day of the long school holidays at Cartoon Network Amazone in Pattaya. Here, at the world’s first Cartoon Network theme park, the young and not-so-young can have fun with much-loved characters such as Ben Ten and the Powerpuff girls. The most popular rides include the Omniverse, which is as high as an eight-storey building and home to six of the fastest and steepest water roller coasters, and the gravity-defying Goop Loop roller coaster where you clamber into an enclosed capsule to drop into a 12-metre free-fall that generates maximum G-force. The XLR8TOR is the park’s tallest and steepest ride, drawing its inspiration from Ben Ten’s lightning-quick reflexes and ability to reach speeds in excess of 480kph. Billed as the “Beach of Bangkok”, Siam Park City is Bangkok’s very first waterpark and was built almost 40 years ago. Michael Jackson came to Siam Park to enjoy the water during his 1993 Dangerous World Tour, and the waterpark is still worth a day trip especially during the hot season. As well as the slide – which in 1970 held the world’s record for the highest at 75 feet – there is an inland sandy beach and a sea with giant waves right in downtown Bangkok. Thailand’s best waterpark is located in Hua Hin – the country’s leading beach holiday destination. Vana Nava is built to mimic a tropical lagoon with palm trees and rock pools spread over 3.2 acres. As well as Boomerango, Thailand’s longest water slide, this waterpark also has the Abass – the largest ride of its kind, which soars to a height of 28 metres then keeps your spinning at 45kph before plummeting and splashing down into a pool. A different style of waterpark from the usual slides and rides, Flow House targets the urban dude and wannabe surfer. With artificial waves and water runners, the fun is real as thrill seekers dare to ride the waves and spin their boards. It’s a place to see and be seen and occasionally transforms into a party scene with DJs where a dude can roam around and show off this tattoos. Make sure you book in advance if you want to ride the waves as the surf house is always packed. Inspired by the blue-and-white tones of Santorini Island in the Aegean Sea, this water park is an excellent choice if you want to avoid the queues at Vana Nava. The Vulcan’s Kamikaze ride from 18 metres might sound scary but it’s addictive. For a bigger adrenaline rush, try the park’s signature Ares’s King Cobra slide that keeps you running over 78 metres from the tail to the head of the snake-like ride. While many amusement parks lay the claim for the “biggest, longest, fastest” accolade, Splash Down takes the form of a lake filled with inflatables designed to hurl thrill seekers into the sky and, of course, into the water. These include the Big Blob, where you jump and see how far you can fly and Big Red Balls that demand you bounce your way across eight, big ball without falling into the pool. Designed for adult and teenagers, this isn’t a place for the little ones. Khao San Road is one of the most popular places in the city to water fight for Songkran. It has amongst the biggest, and wildest, crowds. But this year the party in the backpacker district will be shortened to just two days due to the worst water shortages in 20 years and government requests to save water. Khao San Songkran will take place on April 13 and 14, between Banglampoo intersection and Kokwua junction from the morning of the 13th until 9pm each evening, according to Pol. Col. Rangsarn Praditapohn, superintendent of the Chanasongkram police station. Songkran on Khao San is beloved for many reasons but one of them is the joy of seeing locals and tourists playing together with abandon. The shortened celebration means less of that but it’s also a hardship for many of the vendors who depend on making a lot of money during what is usually a three-day event on Khao San. Piyabutr Jiuramonaikul, president of the Khao San Business Council, said that business owners of Khao San are pleased by the two-day celebration limit. He expects that tourists will use water guns but hopes that people won’t use talcum powder or show too much skin. In response to the initiative to keep the water festival alcohol-free, he doesn’t expect the authorities to have much luck, especially trying to enforce the initiative on foreign tourists. Alcohol is a big part of the modern Songkran celebration, and Khao San is one of the locations where people can imbibe heavily. Piyabutr thought that they may be able to cut consumption by 10 percent this year and maybe another 10 percent the following year. He doesn’t expect that they can remove alcohol completely from the celebration. To keep the area safe, over 150 CCTV cameras will be recording and nine new security gates to keep weapons or alcohol from being brought into the closed streets. 300 police officers will also be patrolling the area 24-hours a day for the two-day celebration, according to Thai PBS. Chinese New Year, the Year of the Monkey. Pictures of Celebrations on several places on the world. Dubbed “Asean prayers”, the campaign aims to boost Thailand’s ties with neighbouring countries through friendly exchanges via the religious dimension, Culture Minister Veera Rojpojanarat said yesterday. This is the first time the Religious Affairs Department has extended this New Year activity to the border provinces of Mae Hong Son, Chiang Rai, Tak, Loei, Nong Khai, Bung Kan, Mukdahan, Nakhon Phanom, Ubon Ratchathani, Si Sa Ket, Sa Kaew, Surin, Ranong and Songkhla, he said. 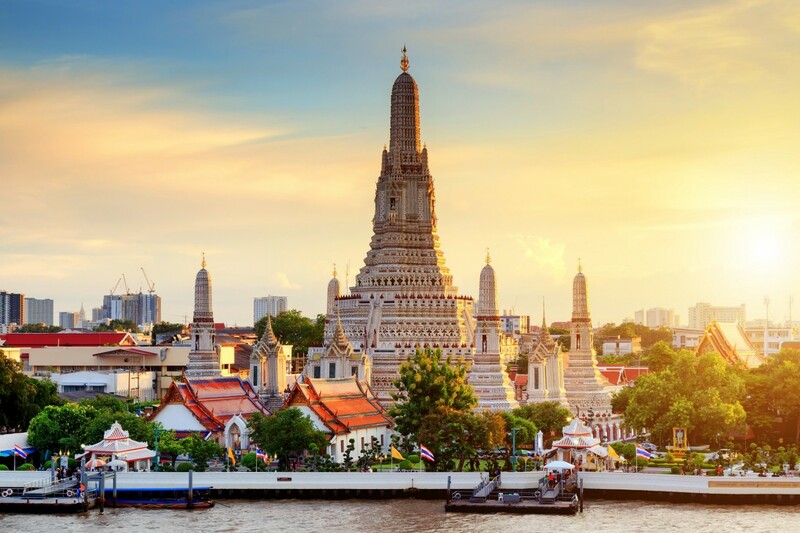 In Central Thailand, traditional prayers will be held on New Year’s Eve at several renowned temples, including Wat Phra Chetuphon Wimonmangalaram (Wat Pho), Wat Sraket Rajavaramahavihara (Golden Mount) and Wat Benchamabophit Dusitvanaram, he added. Meanwhile, police spokesman Pol General Dechnarong Suticharnbancha yesterday inspected police and related officials’ preparedness at four key New Year countdown venues in Bangkok. He said some 4,000 policemen would be deployed to provide security at the most popular countdown site in Bangkok, the CentralWorld Plaza, where some 200,000 partygoers are expected to show up. Early on New Year’s Eve, the area will be cleared of roadside stalls, and before midnight a bomb squad will be on hand to provide security. About 10,000 city law enforcers and police will be patrolling 11 sites across Bangkok and manning 18 metal-detector entrance points, he added. The beginning of the so-called “seven dangerous days” of road accidents yesterday saw Interior Ministry permanent secretary Krissada Boonrat preside over the opening of a Road Safety Centre at the Department of Disaster Prevention and Mitigation. The centre will monitor road accidents and provide daily updates until January 5. Public opinion is being sought over the policy of police and the Peace and Order Maintaining Command to temporarily seize cars and motorcycles from drunk drivers, which has been operating since Christmas Day. A Suan Dusit Poll said yesterday that 80.47 per cent of 1,280 people surveyed from December 24 to 28 agreed with the measure on grounds that it would prevent road accidents, serve as a punishment and as a warning to motorists to abide by traffic laws. About 13 per cent disagreed with the policy, and suggested that fines and prison sentences be imposed, and alcohol-beverage selling outlets be dealt with as the root of the problem. In the Northeastern province of Nakhon Ratchasima, a provincial transport office added another 100 bus trips to its 300-strong daily service yesterday and today, to serve an expected 20,000 holidaymakers. It also conducted alcohol breathalyser tests on bus drivers and checked their buses. Traffic volume on Mitraparp Highway heading towards Nakhon Ratchasima also rose yesterday, but cars were moving at an average speed of 70 to 80 kilometres per hour. 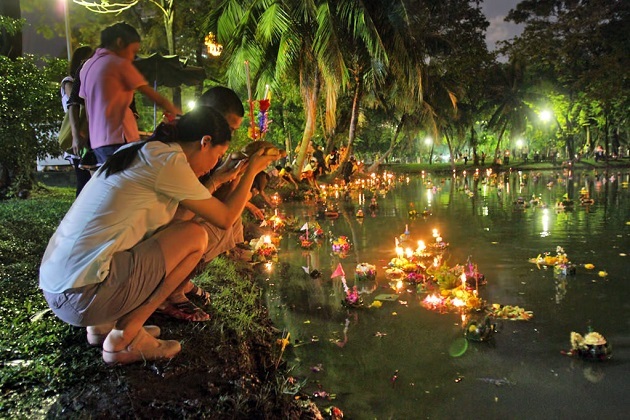 The Festival of Lights is celebrated all around Thailand with Loi Krathongs (lotus-shaped receptacles) released on water to bring luck and fulfill wishes. 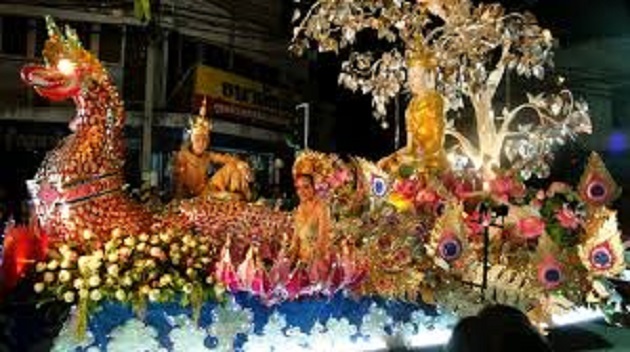 In Chiang Mai, the observation of the festival of lights, called Yi Peng, is uniquely different. Instead of water vessel, Chiang Mai people release thousand of lighted lanterns in the sky while making a wish. The sky transforms itself in a wonderful and surreal sea of little lanterns floating away. The spectacle is mesmerizing. 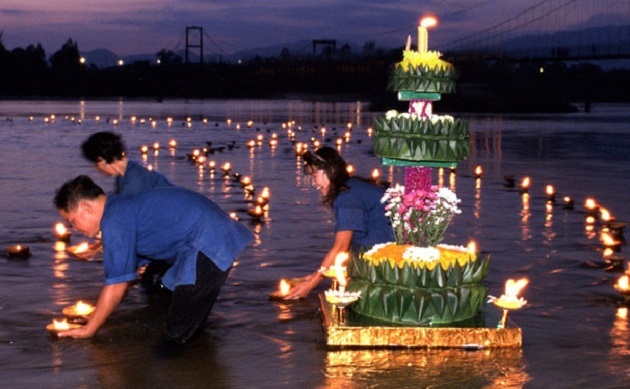 The local celebration of Yi Peng in Chiang Mai is a religious ceremony in Thai language paying homage to the Buddha. The exact date is not announced and is know only a few weeks in advance. A second lantern release specially catered for foreign tourists is held usually one week after the traditional celebration for a fee of 100USD. For the international Yi Peng, the ceremony is in English and the organizer provides lanterns, seating mat, dinner. During the week end, many events will be held in the city of Chiang Mai: traditional Thai dance, Grand Yi Peng Parade,beauty pageants, fireworks, decorations in the old city… Traditional Lanna dance featuring women with long golden fingernails dancing in synchronized movements is one of the event to catch.